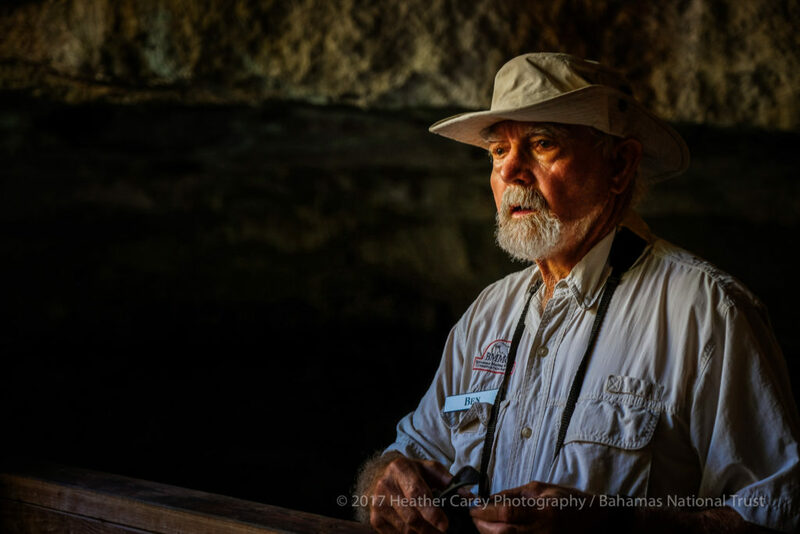 My third adventure with the Bahamas National Trust took me to Grand Bahama for the semi-annual Council meeting. Many moons ago I had visited GB when I worked for the Bahamas Tourist Office in the UK – we took multiple familiarization trips with writers, travel agents and divers and saw the best that the island had to offer. Back then Our Lucaya had just opened and was a beautiful addition to the tourism economy – Port Lucaya was hopping, the golf courses were being played regularly. It was good times. After I had moved back home to Nassau my only visits to GB were sadly in the wake of several hurricanes. A group of friends and I got together to fundraise for backpacks, supplies, clothes etc specifically for 250+ children who were affected by hurricanes – I believe there were 3 that season! While we turned those trips into happy moments – Christmas parties, Santa Claus, lunches, arts and crafts, etc – it was still heartbreaking and GB was not at its shining best. Grand Bahama is still struggling – there is clearly no doubt about that. However, amongst the dimness is a shining light that provides a quiet and soothing respite from the everyday struggles. And that place is the Lucayan National Park (LNP). I don’t recall ever visiting and if I did, it certainly did not leave the impression that it did this time. 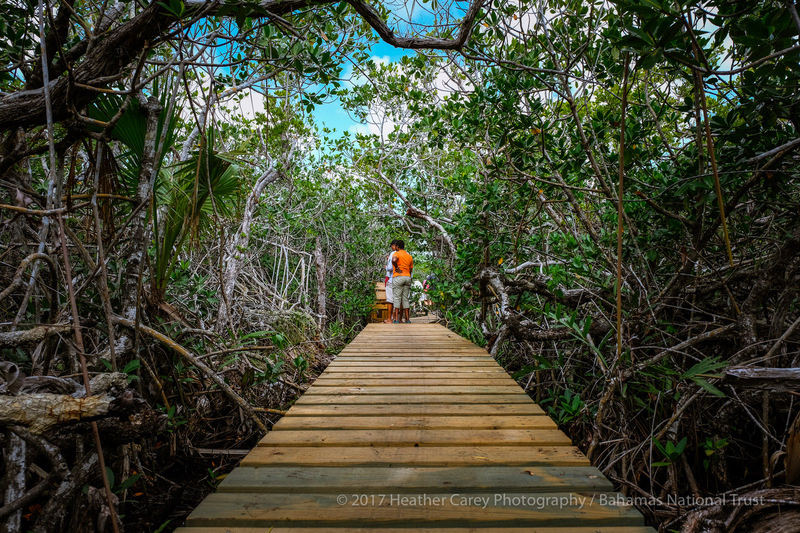 The BNT staff on Grand Bahama have done a great job in managing this park, and improving the infrastructure, with the limited funding that is available to them. Non-profits always have challenges when it comes to funding but it’s particularly hard when operating in a struggling economy, in a small island nation. Here’s a little story about my trip and a few of the wonders worth visiting the LNP to experience for yourself. After a full day of presentations to, and discussions with, the esteemed Council members of the BNT, it was a welcome sight to see this full moon rising from the balcony of the Pelican Bay Hotel in Port Lucaya. As we prettied ourselves up for a cocktail party at which we would be mingling with some potential and existing donors, we had this stunning view to keep us energized. What I love about the Port Lucaya area is all of the waterfront space and activities – bars, restaurants and lounge chairs enabling great bay views and making it easy for the boaters to pull up after a hard day of fishing. 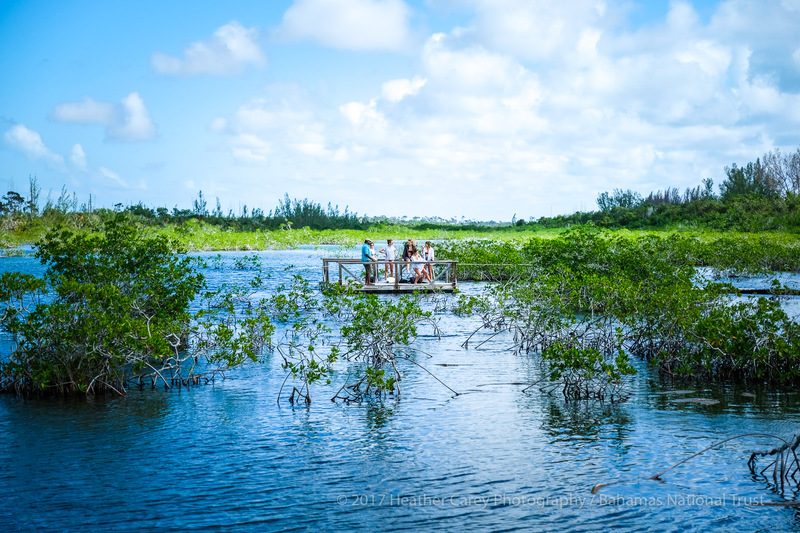 We headed out en masse, Council members and BNT staff, for our tour of Lucayan National Park – about a 30 minute drive out of Port Lucaya. The LNP is about 40 acres of land and was established in 1982. Per the BNT website “The Park contains one of the longest charted underwater cave systems in the world; a unique system of elevated walkways through the last intact mangrove wetland on the southern shore of Grand Bahama, a magnificently wide unspoiled beach showcasing the tallest sand dunes on the island and a wealth of flora and fauna. 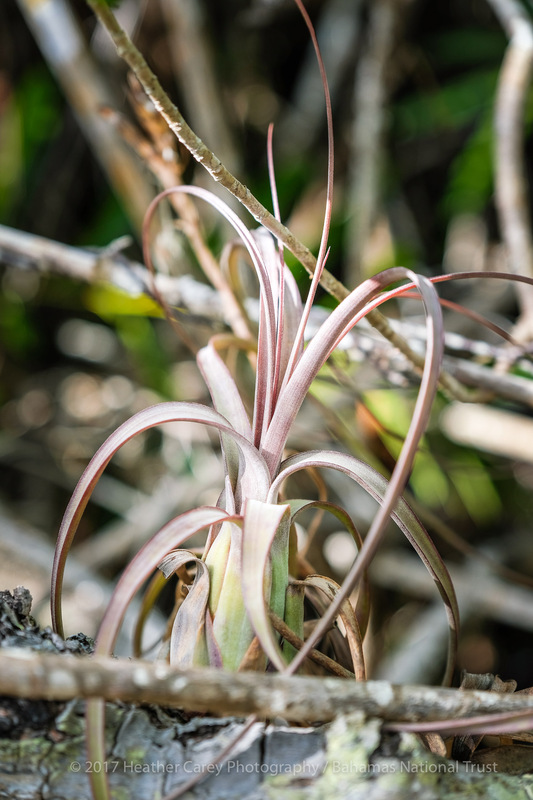 This Park exhibits all of the Bahamian vegetative zones”. 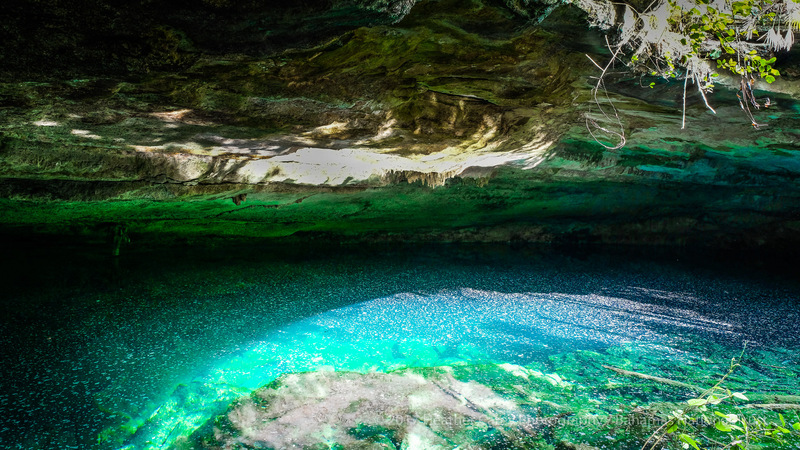 The cave system is approx 6 miles long and can be dived by experienced cave divers via booking with a local company. As well as finding out that a scene from James Bond’s Never Say Never Again was filmed here, you can read a lot more about the importance of protecting this system HERE on the BNT website. Here’s Ben Rose, after whom the Cave was named. Ben is a famed UNEXSO diver and you’ll just have to visit and take his tour to find out how he got an entire cave named after him. 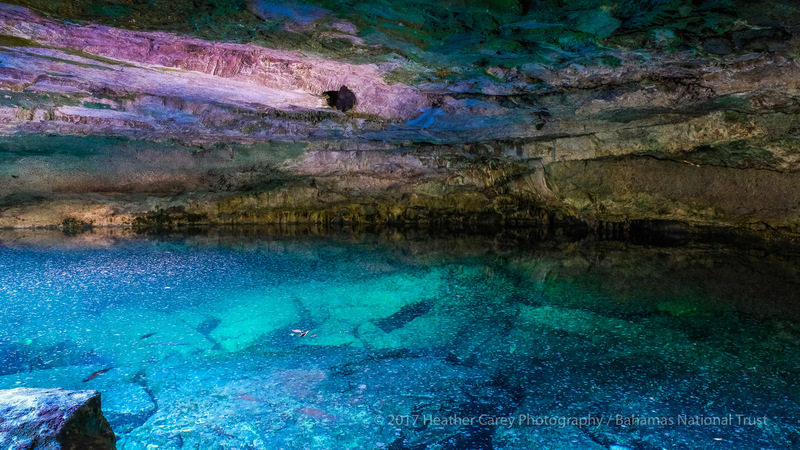 Take a dive and you’ll see stalactites and stalagmites, fossilized conch shells and more…. 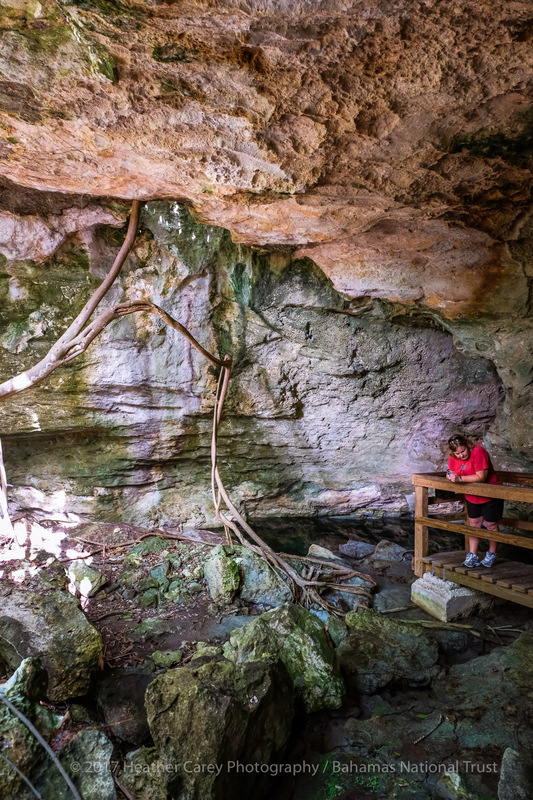 A 2nd Cave which is one of the two blue holes in the LNP system, is called Burial Mound Cave, so called due to the remains of Lucayan Indians that were found in 1986, underwater, perfectly preserved. Caves such as this were used as water sources as well as burial grounds. Look at the amazing root system on this tree! 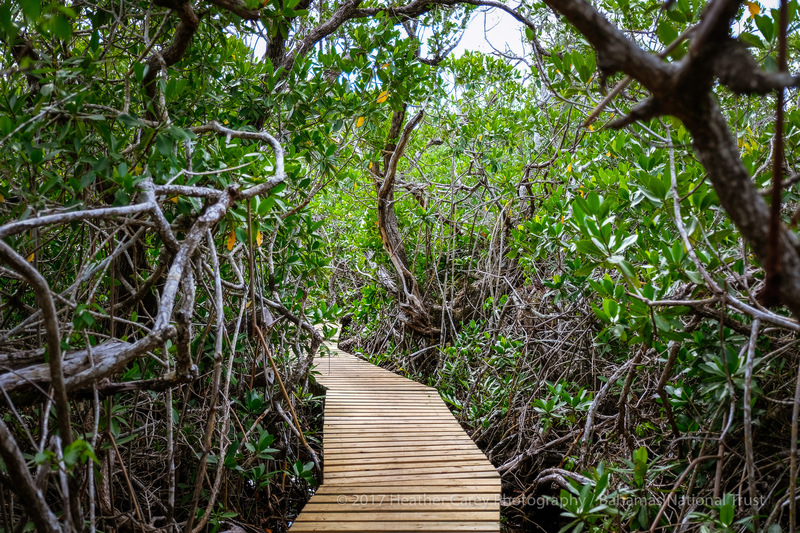 After spending some time exploring the caves, take a walk across the street and follow the boardwalk through amazing mangroves, checking out the orchids and other flora, fauna that thrive there. You may see some raccoons and while they are cute as a button and tempting to cuddle – don’t! They can be vicious and moreso are very destructive to the environment and all that lives there. So, no feeding – but I agree it can be hard to say no! A few companies offer kayak tours within the mangrove creeks and I highly recommend doing this. It’s a peaceful, non-intrusive way to explore and to capture great images of the birds that nest there. While you can certainly get to the beach via the boardwalk, this creek-crossing looks a little more fun and exciting! If you are willing to put in the manual labour, you’ll eventually make it to the other side. Living in the Bahamas I see gorgeous, stunning, sandy beaches everyday. What I love is driftwood and examples of Mother Nature’s artwork that make the landscape a little more interesting. Here’s a snap from the famous Gold Rock Beach (you may recognize it and some of the coast line from Pirates of the Caribbean 2 and 3 which filmed for just shy of a year in Grand Bahama). 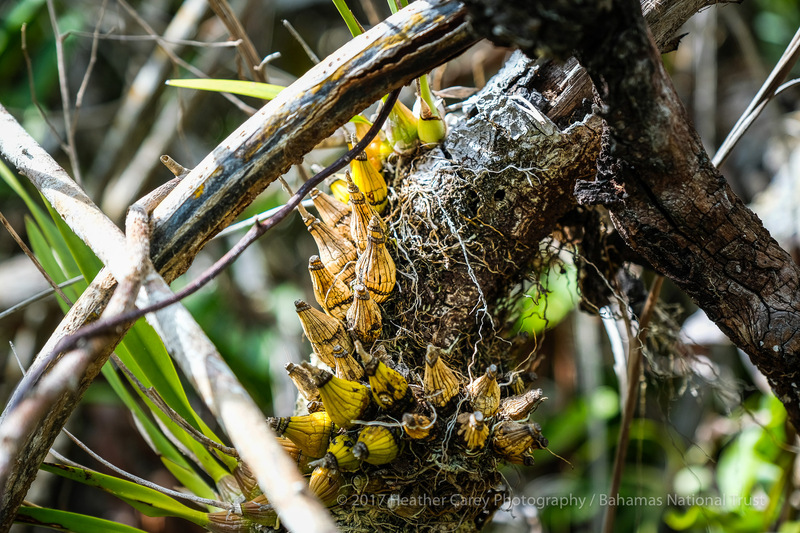 Beautiful orchids attached to mangroves throughout the park. A young, red winged blackbird – who was pretty friendly and joined us for lunch. The cute yet dreaded raccoon. Friends of mine here in the Bahamas rescued a raccoon (Pumpkin) a few years ago and it is become part of their family. A wonderful pet who hangs out with their two pups and seems to think, most of the time, that he is one! Pumpkin has become so famous that he’s been covered by most major media, has his own book, Facebook and Instagram pages! It’s hard to reconcile that their cute little pet could be a series threat to our environment but sadly the raccoons are an invasive species and their populations desperately need to be controlled and in some instances eradicated if we are going to preserve the wildlife that calls the wetland and forest habitats their home. In general I am not a flora/fauna/nature photographer. I love landscapes and I love street photography. 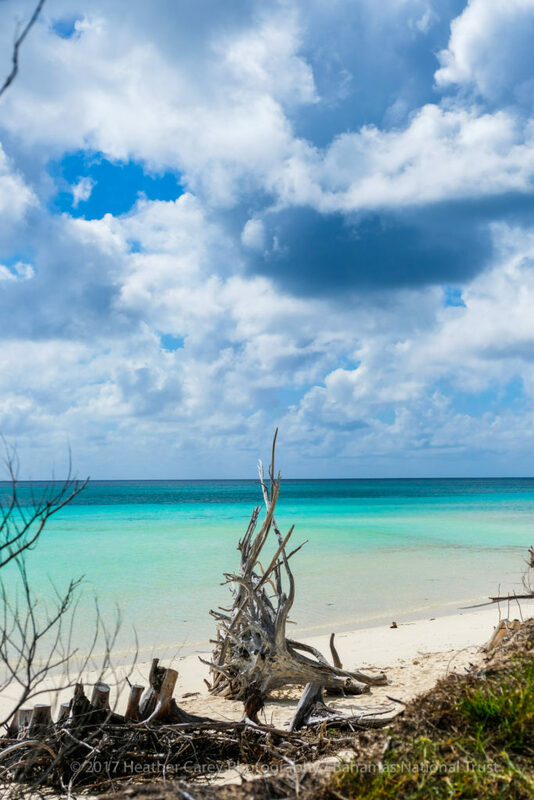 But I am thrilled to have the opportunity to diversify and explore new areas of the Bahamas, with fresh eyes, through my travels with the Bahamas National Trust. There are so many great stories to tell, so many projects we simply don’t know about, and dynamic and passionate staff working throughout our islands to protect these valuable areas for future generations. I am excited to continue to tell these stories, with my own voice, and to explore and hopefully help to overcome, the challenges that every good conservation organization is faced with. Stay tuned!! Inagua will be next! !